What a weekend! We had my son's 3rd birthday party on Saturday and Father's Day on Sunday. The birthday party was construction-themed, fitting for my little "Engineer Junior". I hope to do a post about all the food later this week. Meanwhile, here's what's on deck for this week. In my last post I noted that I'm trying to grill more as it get warmer. Although, with Tropical Storm Andrea swinging past close enough to make it a yucky, rainy day today, I think I'll skip on tonight's planned grilling session. This past Tuesday was gorgeous: mid-70s and dry! My son and I played on the deck while I grilled dinner and then we ate on the deck. My Girl Scout troop meeting was even held on the deck! 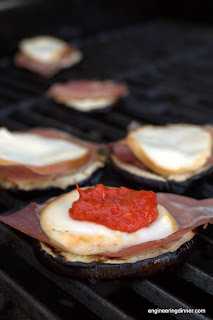 We had eggplant stacks and they were amazing. You can't go wrong with prosciutto and fresh, smoked mozzarella cheese. Some people would argue that anything with eggplant is wrong, but I think it's an acquired taste. I started out with a variety called graffiti that I get at our farm market. The skin seems to be thinner than some other varieties. I have since graduated to normal, grocery store varieties, such as these pictured here. The first key to preparing eggplant is to salt it and let it sit for about 20 minutes. This removes some of the moisture and makes it less rubbery when you cook it. I press kosher salt into both sides of each slice and place it in a colander over the sink. Make certain to rinse each piece before cooking! 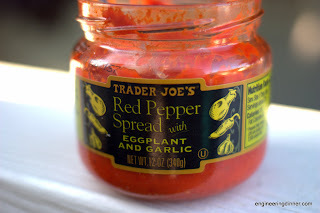 I top each stack with a red pepper spread, which I cheat and purchase from Trader Joe's. I use it on so many different things from sweet potato to fried egg sandwiches to this recipe. My father-in-law enjoys it on ham or turkey sandwiches. Salt eggplant as described above. Preheat grill with all burners on high. Rinse and dry eggplant and spray or brush on olive oil. Place on grill over medium heat. (I place the food over my two center burners, which are turned off. The two outer burners are on medium-high heat.) Grill for about 5 minutes or until you get good grill marks and the eggplant has softened some. 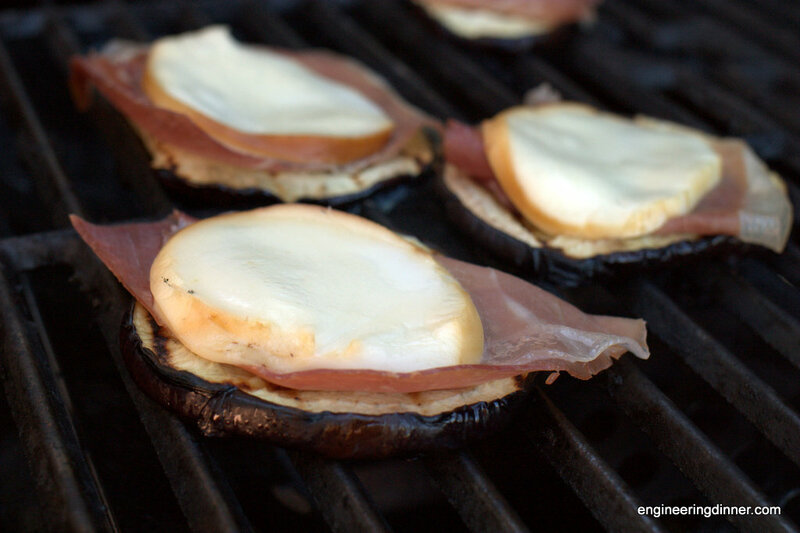 Flip eggplant over and place a piece of prosciutto and mozzarella on each eggplant slice. Grill for about 5 minutes more. Remove from grill, top with red pepper spread, and serve! This recipe has been shared on Vegetarian Mamma's Gluten Free Fridays and Allergy Free Alaska's Whole Food Fridays. Now that the summer heat is upon us, I'm turning to grilling a bit more to avoid the oven and adding heat to the house. This does require me to re-tool my meal planning, though, and find new, grill-able standards.